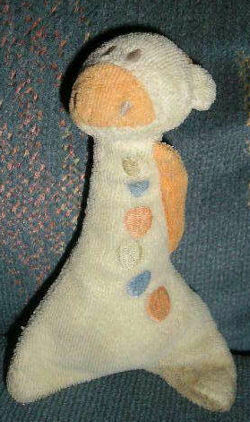 My daughter has lost her giraffe plush toy that she had gotten as a gift when she was born. It’s a little yellow plush giraffe, and it’s a plush toy that came in a 5 piece blanket set by Magic Years. It’s only I’d say about 5-6 inches tall. She has fallen in love with it ever since then, and it’s her life. She brings it everywhere and can’t sleep without it. We had just lost it recently when we went to McDonald’s. Her grandma had been playing with it and put it in the hood of her jacket. She had to run inside McDonald’s, because they forgot her fries, and I believe it dropped out of her hood. Someone must have picked it up. This is the second one she had gone through. I was lucky to find it the second time. I had bought it off a website called Rainbow Baby online at rbkids.com. But this time I have had no luck, and they are out of it, and I can’t find it anywhere else online. Please someone help me find somewhere online where they might sell it, or if they found it. We live in Rancho Cucamonga,CA, and we lost it at the McDonald’s on Foothill and Milliken. She misses her lost friend! was it all plush, did it crinkle? rattle?